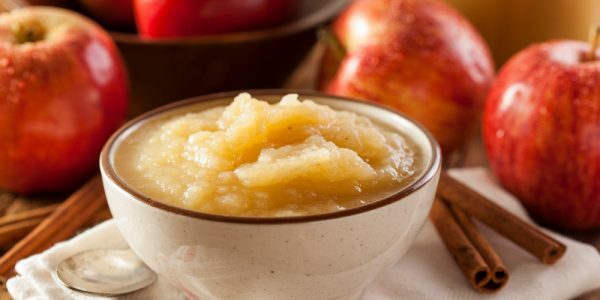 Homemade organic applesauce in 30 minutes. I love going to the local Organic U-Pick farm. Rather than pick our selves, we cheated and grabbed two boxes of apples for me to use. That’s 80 pounds of apples since each box weighs in at 40 pounds a piece. My son had been nibbling away at them and I probably ended up with 70 pounds this past week. Not too bad! ( I must be nuts… some day I’ll stop the madness but when you get out there and smell that fresh fruit and start picking…it’s terrible). So, what do you do with 70 pounds of apples? Consult my apple recipes and make applesauce for one. It is so good homemade with organic apples and sweetener, just enough and not too much, fresh and hot… oh my! I think we ate 1 1/2 cups each at least when it was still warm. And the heavenly aroma wafted through out the house. I can still smell it. Making your own allows you to use organic sweetners and how ever much of it you want. You are in control, that’s the important thing. You get to chose for your family, not some big company out there. That’s it.Â Pure and simple. Those are the best. Peel,core and slice the apples and place in a large stock pot. Now, you may be thinking that’s a lot of apples to peel,core and slice. It is. It took me 35 minutes to do them by hand. It took me 12 minutes to do them with an apple peeler.Â Sometimes it pays to get the equipment. Add the water to the apples and cook until soft and squishy. Remove from the heat and pour in the agave syrup or honey and sprinkle on how ever much cinnamon you want. I dusted the top very liberally. We like our cinnamon! Take a stick blender and blend until pureed. Done! Eat it right now. Then place the leftovers in the frig. It should keep for two weeks, if it stays around that long which is highly unlikely. I decided to go ahead and preserve my applesauce and give some away as Christmas presents to my adoring family. They really do like getting these kinds of things from me. I usually give food gift baskets, mostly homemade goodies. This year will be…applesauce, apple blackberry jam and a loaf of artisan bread from a local bakery. Everyone will love it! If you want to preserve it, get out your pint or quart jars, fill with hot applesauce place on lids and bands and process in a boiling water canner for 20 minutes. Take out, let cool and then store. The apple peeler is the way to go. And for around $20 bucks it’s a bargain. This copyrighted material may not be republished without express permission. The information presented here is for general educational purposes only. MATERIAL CONNECTION DISCLOSURE: This website contains advertisements. You should assume that this website has an affiliate relationship and/or another material connection to the persons or businesses mentioned in or linked to from this page and may receive commissions.